Tan Min-Liang, CEO of Razer. 1. Sim Wong Hoo, the founder, chairman and CEO of Creative Technology Ltd, graduated with a Diploma in Electrical and Electronics Engineering from Ngee Ann Polytechnic. He was once dubbed Singapore’s greatest tech entrepreneur. In 1989, Sim launched the Creative Sound Blaster audio card—a piece of computer hardware used in computers to play sounds and music. Since then, more than 400 million of Creative Technology’s Sound Blaster products have been sold worldwide. Creative Technology used to be the de facto audio standard for IBM compatible PCs until Microsoft introduced Windows 95, which integrated audio functions with the motherboard, eliminating the need for an external sound card. Before Apple invented the iPod, Creative was rolling out the world’s earliest digital audio players, including the Creative Nomad Jukebox. Its Sound Blaster Roar also won the President’s Design Award in 2014. He coined ‘No U-turn Syndrome’ (NUTS) to refer to the typical Singaporean mindset of seeking approval from higher authorities before any endeavour, which in turn hampers innovation. “Singapore can be a tough environment for entrepreneurship,” Mr Sim said during an interview with the New York Times in 1994. 2. 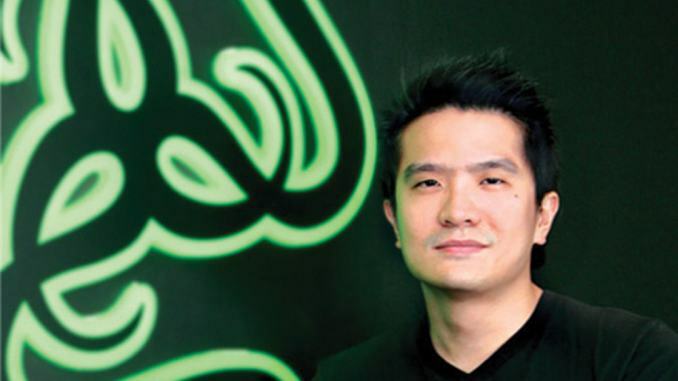 Driven by his passion for gaming since young, Singaporean Tan Min-Liang started Razer Inc. in California with Robert Krakoff after quitting his job as a lawyer in 2005. Back then, everyone thought he was crazy as nobody believed gaming was something you could make a living from. But with the belief ‘either I do it now, or I regret it the rest of my life’, Tan ventured into the unknown. Today, the 10-year-old company is worth US$1 billion (S$36 billion) and is one of the world’s leading brands in gaming user interfaces, gaming systems and gaming software applications, employing around 500 staff in ten cities across the globe. From its first invention, the Boomslang mouse, Tan and his team have developed a range of gaming mice, gaming keyboards, gaming headsets, gaming systems and gaming software applications over the years. Their gaming innovations are for gamers, by gamers. The Singaporean co-founder, CEO and Creative Director of Razer Inc. is described by the media as a mini Steve Jobs. Tan was ranked No. 3 among the world’s top tech leaders by UK-based Juniper Research. Nearer to home, he topped TechinAsia’s list of Southeast Asia’s top 30 tech founders. “In schools, students are told that they have to pass examinations, and failing will destroy their lives,” said Tan in an interview with TechinAsia. A risk-taking maverick, the former law student at the National University of Singapore channelled his gaming obsession into a “hard-core tech work” company that designs cutting edge gaming products, turning a ‘time-wasting’ passion into his greatest asset. What drives him is the attitude ‘go ahead because it’s fun’. No wonder Razer has a strong legion of wildly devoted fans. 3. “A meaningful life isn’t about acquiring money & other facilities; it’s about dedicating your life to helping others as much as you can,” wrote Siu Rui Quek, 28, co-founder of Carousell, on his Twitter page. The top National University of Singapore (NUS) business graduate has always opted for the road less travelled. Despite having stellar O Level results in an era that favoured the Junior College route, he chose to enrol in Ngee Ann Polytechnic’s business studies course as he wanted to be engaged in projects that stimulate ideas. Working at a Silicon Valley video conferencing start-up under the NUS Overseas College Programme at Stanford University made Quek set his heart on becoming an entrepreneur.